Our everyday hero and storyteller is named Usnavi (a name his parents gave him inspired by a ship they saw as they were immigrating from the Dominica Republic - US Navy). 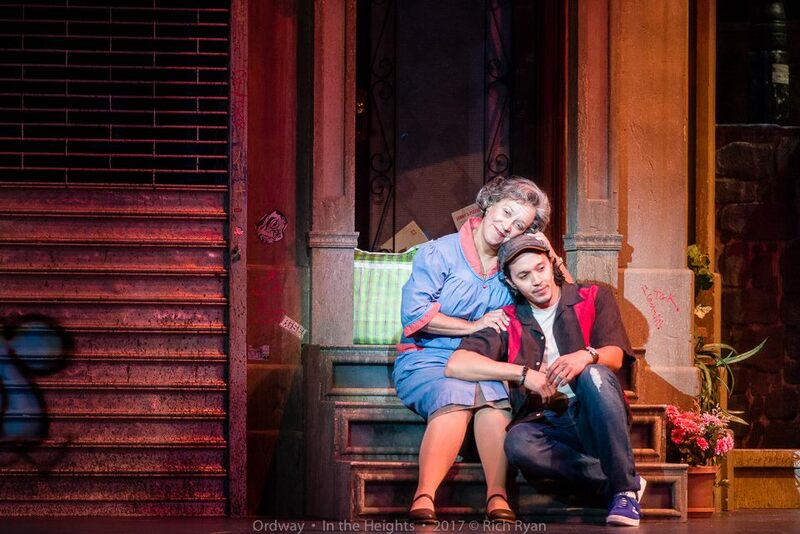 But this isn't really Usnavi's story, it's a story of his Washington Heights neighborhood and the people who inhabit it. There's Usnavi's young cousin Sonny, who helps him run the bodega (a neighborhood grocery/convenience store), and Vanessa, Usnavi's crush, who dreams of getting out of the heights and moving downtown. Nina is returning home for the summer after her first year at Stanford, with a secret she's forced to share with her parents, who run the local car and limo service. Benny is a driver with the service, and a love interest for Nina despite her parents' disapproval (he's not Latino). And everybody loves Abuela Claudia, the grandmother to the neighborhood. The dramatic tension comes from a certain winning lottery ticket and changes in the neighborhood, some of which are due to gentrification which makes it harder for working-class people to live and work there. But in the end, as Usnavi sings in the finale, this is and will always be Home. Whether you're from a small town in Minnesota or the greatest city in the world (if you've never been there, you might be surprised to learn that NYC is actually made up of many diverse close-knit neighborhoods that feel like small towns), you can relate to the idea of Home. A home you want to come back to for comfort, or a home you're itching to escape from to the greater world beyond. In the Heights is a perfect example of one of my favorite ideas about art - the more specific something is, the more universal it is. This is a specific story of a Hispanic neighborhood in NYC, specific in its characters, music, and culture, but one with universal resonance to anyone with a home, a family, or a community that at times feels stifling, at other times welcoming. This post is already getting way too long, so let me quickly run through this all-star cast. Justin Gregory Lopez returns to the Ordway stage after last year's reimagined Paint Your Wagon, and ably steps into LMM's shoes (not an easy task) as the genial Usnavi. Val Nuccio and Aline Mayagoitia have lovely voices as Vanessa and Nina, Debra Cardona is a warm and comforting Abuela, and Stephen Scott Wormley is a wonderful Benny. Adan Varela steals scenes as the Piragua Guy with his lovely voice, Fernando Collado is adorable as Sonny, locals Pedro R. Bayón and Lara Trujillo are strong as Nina's parents, and Emily Madigan and Lauren Villegas make a great comedy team as the gossiping hairdressers. And this entire 25-person ensemble is just terrific - energetic, fully in the moment, and endlessly watchable, so much so that it's impossible to take them all in at once. Original Broadway set designer Anna Louizos (whose work can also be seen across the river at the Guthrie's Romeo and Juliet) brings her Tony-nominated scenic design to the Ordway stage, which realistically recreates a Washington Heights neighborhood, complete with fire escapes and a view of the George Washington Bridge. Local costume designer Trevor Bowen brings his unique style to neighborhood residents with fun, colorful, character-defining costumes. Eugenio A. Vargas and his 9-piece his pit orchestra sound fantastic playing this Tony-winning score that incorporates rap, hip-hop, and pop with a Latin beat that makes you want to get up and dance. Which, fortunately, this cast does. The dancing in this show is so amazing I wish I knew more about dance and had more words to talk about it. 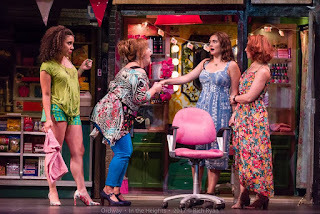 Co-choreographed by Teatro del Pueblo's Alberto Justiniano and the Ordway's James A. Rocco (who also co-direct), it's so full of energy, so modern, just absolutely enthralling to watch, and gorgeously performed by the entire ensemble, especially Brian Bose as Grafitti Pete. 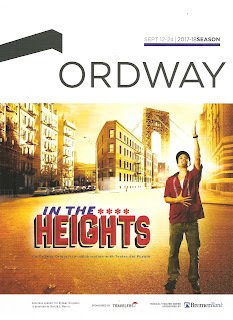 After their gorgeous production of West Side Story this spring, the Ordway faced some controversy, due in part to an unfortunately worded article, that resulted in more conversations* about the local Latinx community. The Ordway partnered with Teatro del Pueblo on both productions, and without rehashing all of the issues, I think the Ordway has really righted any wrongs with this production of In the Heights. While many of the leads are nationally cast (which is not unusual for Ordway productions), over half of the cast is locally based, including several featured roles. 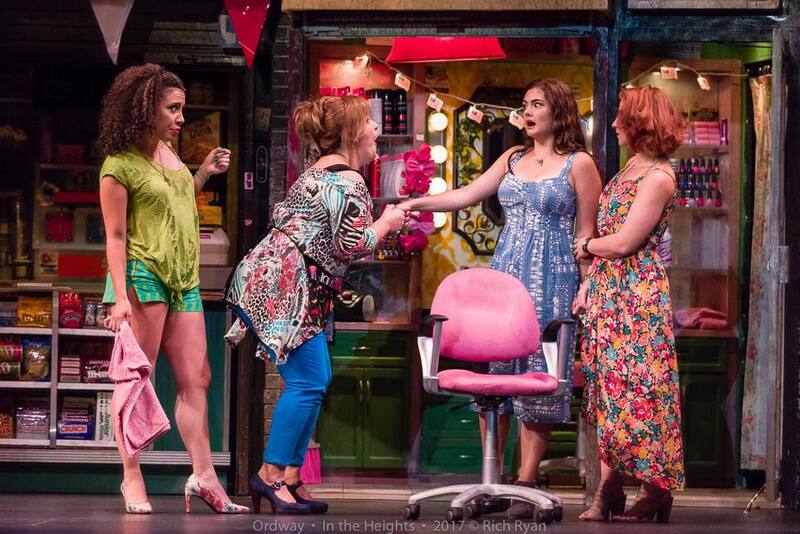 And more importantly, In the Heights tells a modern, relevant, sympathetic, fully formed Latinx story in the way that the 60-year-old West Side Story does not. I saw the first Broadway tour of In the Heights back in 2009, pre-blog. But I did post a list of my top 10 shows on my Facebook page that year, and In the Heights was one of them. At the time I called it "everything musical theater should be - original, relevant, and inspiring." Still true, and so much more. Not coincidentally taking place on the 4th of July, In the Heights is every bit the quintessential American story that Hamilton is. If you're a fan of musical theater or at all interested in Hamilton, you owe it to yourself to see the master's first masterpiece, which everyone at the Ordway has obviously put a lot of blood, sweat, and tears into making as good as it can be. But it's only playing through next weekend, so don't miss your chance! (More info here, with discount tickets available on Goldstar). *The Twin Cities Theater Bloggers were so inspired by this and other conversations that we are continuing them in a monthly series of open discussions called "Continuing the Conversation." The next installment is Monday September 18 at Park Square Theatre, with a focus on persons with disabilities (the event is free and open to the public, more info here).